have you ever wondered what Anglo-Saxon might have sounded like ? Despite first appearances, the English we speak now is a direct descendant of Anglo-Saxon. So have you ever wondered what Anglo-Saxon might have sounded like ? In this article we look at one particular epic Anglo-Saxon poem, ‘The Battle of Maldon’ to see how Anglo-Saxon was written and how it would have sounded. When the Saxon invaders came to Britain in the 5th and 6th centuries they brought with them their own language. Although they did not kill all the native Britons they did almost destroy their language and replacing the native ‘Celtic’ language with their own ‘Germanic’ tongue. With the new language, of course, came new place names, many of which survive to the present day. The existing settlements were not destroyed, but the Saxons found the names difficult to pronounce, so they renamed them in their own language. The Anglo-Saxon poem of ”The Battle of Maldon” is an excellent example of written and spoken Early English. It’s split into 3 sections below with the Anglo-Saxon text, a modern English translation and a narration of the poem so we can again here the ancient tongue of early English. It’s fun to see how much we can recognize from a direct descendant of our modern language that’s over 1,000 years old. The Battle of Maldon is a poem describing a historical skirmish between East Saxons and Viking (mainly Norwegian) raiders in 991. The poem is remarkable for its vivid, dramatic combat scenes and for its expression of the Germanic ethos of loyalty to a leader. The poem, as it survives, opens with the war parties aligned on either side of a stream (the present River Blackwater near Maldon, Essex). The Vikings offer the cynical suggestion that the English may buy their peace with golden rings. The English commander Earl Byrhtnoth replies that they will pay their tribute in spears and darts. The poem is incomplete hence the rather odd beginning! In preparation for battle, a warrior sets his hawk free to fly to the forest. Likewise the warriors send their horses to the rear. Byrhtnoth, the Ealdorman, arranges the young men who have come to fight [the untrained youths of the Essex levy, it seems], teaches them how to hold sword and shield and where to stand. Then he goes to the company of his hearth companions who will be in the vanguard of the fight. The Viking herald calls across the water, offering to accept tribute for peace and not to fight. The English and the Vikings are not able to attack each other, save with arrows, while the water flows between them. Then, when the narrow causeway becomes passable, the English have the advantage, and no Vikings can gain the shore. The Vikings call for Byrhtnoth to allow them to cross to have a more even fight, and then the Eorl, on account of his ofermod, allows them to come across the water. brocen wurde. Het þa hyssa hwæne hors forlætan, feor afysan, and forð gangan, hicgan to handum and to hige godum. and bæd þæt hyra randas rihte heoldon fæste mid folman, and ne forhtedon na. þa he hæfde þæt folc fægere getrymmed, he lihte þa mid leodon þær him leofost wæs, þær he his heorðwerod holdost wiste. þær com flowende flod æfter ebban, lucon lagustreamas. To lang hit him þuhte, hwænne hi togædere garas beron. Hi þær Pantan stream mid prasse bestodon, Eastseaxena ord and se æschere. hwa þære wælstowe wealdan mote.” Wodon þa wælwulfas (for wætere ne murnon), wicinga werod, west ofer Pantan, ofer scir wæter scyldas wegon, lidmen to lande linde bæron. would be broken. Then he ordered a warrior each horse be let free, driven afar and advance onward, giving thought to deeds of arms and to steadfast courage. and ordering that their shields properly stand firm with steady hands and be not afraid. Then when he beheld that people in suitable array, he dismounted amid his people, where he was most pleased to be, there amid his retainers knowing their devotion. who on this field of honor may be allowed to be the master of." Then advanced the wolves of slaughter, for water they cared not for, this band of Vikings; west over the Pante’s shining water shore they carried their shields, these men of the fleet towards land advanced their linden shields. The Vikings cross and the battle begins in earnest. For a while the English are doing well, with many individual acts of heroism but then Byrhtnoth is killed by a thrown spear. Wulfmaer the Young draws out the spear and throws it back at the Viking, killing him, but Byrhtnoth has received his fatal wound. Byrhtnoth thanks God for all the blessings he has received on earth, but then the Vikings kill him and the men next to him. And with Byrhtnoth dead, some of the English flee the battle, most visibly the sons of Odda. Godric leaps on Byrhtnoth’s horse and rides away. The hearth-companions do not give up, however, and continue to fight and inspire each other with speeches. on fægean men feorh gewinnan, wigan mid wæpnum; wæl feol on eorðan. Stodon stædefæste; stihte hi Byrhtnoð, bæd þæt hyssa gehwylc hogode to wige þe on Denon wolde dom gefeohtan. þæt gewundod wearð wigena hlaford; he sceaf þa mid ðam scylde, þæt se sceaft tobærst, and þæt spere sprengde, þæt hit sprang ongean. Gegremod wearð se guðrinc; he mid gare stang wlancne wicing, þe him þa wunde forgeaf. bæd gangan forð gode geferan; ne mihte þa on fotum leng fæste gestandan. He to heofenum wlat: “Geþancie þe, ðeoda waldend, ealra þæra wynna þe ic on worulde gebad. þæt hi helsceaðan hynan ne moton.” ða hine heowon hæðene scealcas and begen þa beornas þe him big stodon, ælfnoð and Wulmær begen lagon, ða onemn hyra frean feorh gesealdon. þæt þær modiglice manega spræcon þe eft æt þearfe þolian noldon. þa wearð afeallen þæs folces ealdor, æþelredes eorl; ealle gesawon heorðgeneatas þæt hyra heorra læg. nu mæg cunnian hwa cene sy. Ic wylle mine æþelo eallum gecyþan, þæt ic wæs on Myrcon miccles cynnes; wæs min ealda fæder Ealhelm haten, wis ealdorman, woruldgesælig. þa he forð eode, fæhðe gemunde, þæt he mid orde anne geræhte flotan on þam folce, þæt se on foldan læg forwegen mid his wæpne. Ongan þa winas manian, frynd and geferan, þæt hi forð eodon. that these doomed men would fall in battle. There came the loud clamor. Ravens circled around, eagles eager for carrion. On Earth was the battlecry. They then sent forth from their hands shafts hard as file, murderously sharpened spears flew. of doomed men’s life destroy, warriors with weapons. The slain in battle fell to Earth. Steadfast and unyielding, Byrhtnoth exhorted them, bidding that each young warrior’s purpose to this battle, against the Danes a desire to win glory in war. that wounded the warrior lord. He thrust then with his shield such that the spear shaft burst, and that spear-head shattered as it sprang in reply. Enraged became that warrior: with anger he stabbed that proud Viking who had given him that wound. bidding to advance stoutly together. Not could he on his feet any longer stand firmly up, and so he looked to heaven: "I thank you, Lord of my people, all the joys which I on this world have experienced. the fiends of hell shall not be permitted to harm me." Then he was slain by the heathen warriors; and both of those warriors which by him stood, Aelfnoth and Wulmaer were each slain, close by their lord did they give up their lives. that there would be boldly many a boastful speech which at the time of stress would not endure. So now was laid low the Chief of this army, Aethelred’s Earl. All saw those sharers of the hearth that their lord lay slain. Now may we prove who is truly valiant! I am willing that my royal descent be made known to all men, that I was of Mercian blood greatly kindred; my grandfather was named Ealhelm, a wise alderman and very prosperous. Not shall me these people’s liegeman reproach that I of this army am willing to depart from, a homeland seek, now that my lord lies slain and hewn down in battle. Mine is that sorrow greatest: he was both my kinsman and my lord." Then he advanced onward, remembering with hostility, then he with spear-point pierced one pirate in their host, and to the ground lie slain killed with the weapon. He began then to exhorted his comrades, friends and compatriots, that they advance onward. Offa speaks, saying the Godric has doubly betrayed them all, as some of the English, seeing Byrhtnoth’s horse riding away, think that the Ealdorman had given a signal for retreat. It is now obvious that the Vikings will own the day. But Leofsunu swears not to step back one foot from the battle but instead will fight to the death. Other men also refuse to leave. Mind the stronger, as our strength lessens. He, and the rest, stay fighting by the side of their dead lord. The poem ends by mentioning another Godric who was killed fighting, not the cowardly one who had fled. wordum ætwitan, nu min wine gecranc, þæt ic hlafordleas ham siðie, wende fram wige, ac me sceal wæpen niman, ord and iren.” He ful yrre wod, feaht fæstlice, fleam he forhogode. þa hi forð eodon, feores hi ne rohton; ongunnon þa hiredmen heardlice feohtan, grame garberend, and god bædon þæt hi moston gewrecan hyra winedrihten and on hyra feondum fyl gewyrcan. þæt he nolde fleogan fotmæl landes, ofer bæc bugan, þa his betera leg. He bræc þone bordweall and wið þa beornas feaht, oðþæt he his sincgyfan on þam sæmannum wurðlice wrec, ær he on wæle læge. swa he beotode ær wið his beahgifan þæt hi sceoldon begen on burh ridan, hale to hame, oððe on here crincgan, on wælstowe wundum sweltan; he læg ðegenlice ðeodne gehende. Swa hi æþelgares bearn ealle bylde, Godric to guþe. Oft he gar forlet, wælspere windan on þa wicingas, swa he on þam folce fyrmest eode, heow and hynde, oðþæt he on hilde gecranc. to reproach my word, now that my patron has perished, that I now lordless go on a homeward journey, having turned away from battle, but rather I shall be taken by weapons, either spear or iron." Wrathfully he advanced, fighting resolutely, for he despised flight. Dunnere then said, brandishing his spear, a simple yeoman calling out to the entire shore, exhorting that each warrior avenge Byrhtnoth: "One cannot retreat who intends vengeance for our lord of the host, if their lives they care not for." So then they pressed forward, caring not about their lives. Then began these retainers to fiercely fight, ferocious warriors armed with spears, and praying to God that they might avenge their lord and patron and on their enemy death make. that he would not flee a foot’s ground, or turn away back to the bank, then leave his superior where he lay. He broke through that wall of shields and among the warriors fought, until his bounteous lord upon those sea-men did worthily avenge, and he on the battlefield lie slain. that he had uttered before to his giver of rings, that either they both ride to the fortified home unhurt or else perish fighting on the battlefield and die of their wounds. He lay slain nobly near the lord of his people. goodly he lies in the dust. A kinsman mourns that who now from this battle-play thinks to turn away. I am advanced in years. I do not desire to be taken away, but I by my liege Lord, by that favorite of men I intend to lie." So then did Aethelgar’s child enbolden them all, Godric to battle. Often he sent forth spears, deadly shaft sped away onto the Vikings; thus he on this people went out in front of battle, cutting down and smiting, until he too on the battlefield perished. FACTOID #1 : Where did they come from? 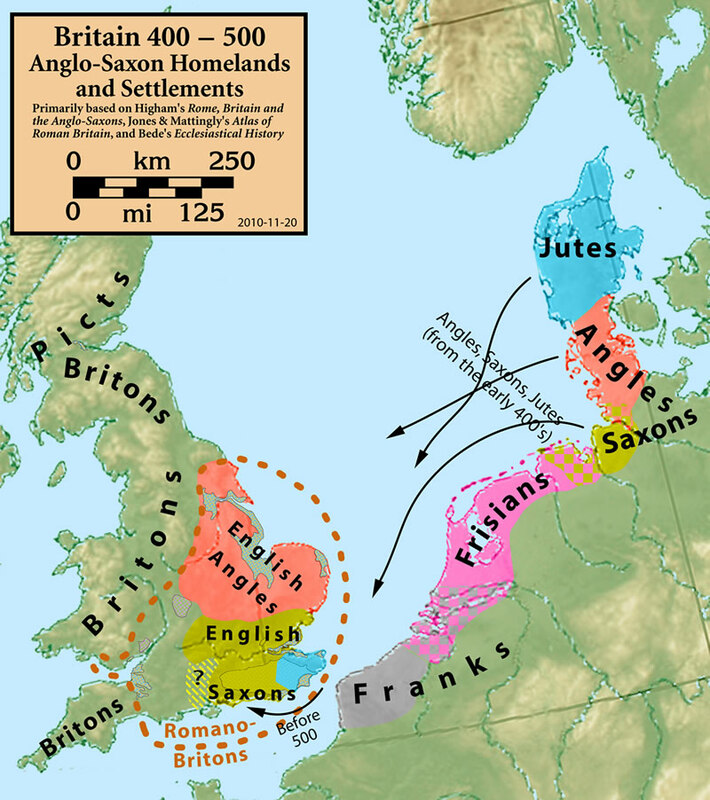 The Anglo-Saxons are in fact a combination of 3 different European peoples: the Angles; Saxons and Jutes. They originated from what is modern day Germany, Denmark and the Netherlands. The impetus to move was land pressure in their home countries. The land was often of poor quality, often flooded and therefore proved difficult to grow crops, so they were looking for new places to farm. In addition some Britons invited them to keep out invaders from Scotland and Ireland, offering them money in return. 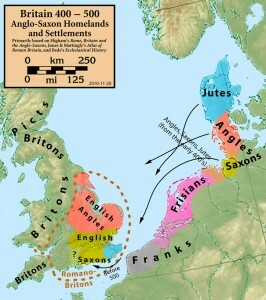 The native Britons were gradually displaced by the invaders. Those that didn”t like the Anglo-Saxons fled westward to live in Wales and Cornwall. The evidence of which we can still see today in the Celtic languages of Welsh & Cornish. Old English was the West Germanic language spoken in the area now known as England between the 5th and 11th centuries. Speakers of Old English called their language Englisc, themselves Angle, Angelcynn or Angelfolc and their home Angelcynn or Englaland. Old English began to appear in writing during the early 8th century. Most texts were written in West Saxon, one of the four main dialects. The other dialects were Mercian, Northumbrian and Kentish. Old English / Anglo-Saxon was sometimes written with a version of the Runic alphabet, brought to Britain by the Anglo-Saxons until about the 11th century. Monday : The Moon is the Goddess of hunting. She wears a white robe and carries a bow and arrow. Tuesday : Tiw is the God of war. He dresses like an Anglo-Saxon warrior and carries a battle-axe. Wednesday : Woden is the chief God. He dresses like a king and carries a spear to show his authority. Thursday : Thunor is the God of thunder. He dresses like a warrior and carries a bolt of lightening. Friday : Freya is the Goddess of love and the wife of Woden. She carries no symbols because she is so beautiful. Saturday : Saturn is the God of fun and feasting. He is fat and jolly. Sunday : The Sun is the God of life. He is often shown as a youth with a sun halo.